Interactive Cape Town Map (s), Street Map of the City of Cape Town. As you will see on the Cape Town map (s) below that Cape Town is to be found right up north on the Cape Peninsula, in the south western corner of the Western Province in South Africa. Bordered by Table Bay in the north and a cordon of mountains in the south, the city centre lies in a kind of bowl that stretches into Table Bay. This cordon of mountains, includes the well known Table Mountain, Devil's Peak, Lion's Head and the Twelve Apostles. They form the one end of the range of mountains stretching like a steep and rocky spine down the length of the Peninsula from Cape Town to Cape Point. The metropolitan area of Cape Town comprises more than 70 peaks with an average height of 300 meters. The many suburbs of the city, of which many are situated on the Cape Flats, extend well beyond the mountains encircling the city bowl. When navigating in and around Cape Town, there is the one and only world renown beacon that makes it easy to find your way around and that is Table Mountain. An overview map showing you where Cape Town and the Western Province are situated. click on the picture to see an enlargement. When you click on the enlarged picture again, it enlarges even more. 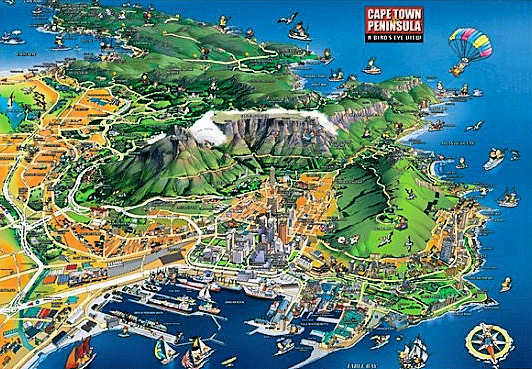 Encircled by Table Mountain at the back in the south, flanked east and west by Devil's Peak, Lion's Head and Signal Hill and facing the Atlantic Ocean in the north, the Cape Town map will show you Cape Town's city centre lying in a kind of basin-like enclosure, often referred to as the City Bowl. The City Centre consists of the CBD, Foreshore, Devil's Peak, Vredehoek, Oranjezicht, Tamboerskloof, Higgovale and the Bo-Kaap. From its industrious foreshore, through the central business district and up into the suburbs, Cape Town city is showing off its modern day metropolitan characteristics amidst an abundant historical background. Interactive map of the city centre of Cape Town including the Victoria & Alfred Waterfront, Green Point and Sea Point. Next to beautiful beachfront villages and relaxed suburbs, the Peninsula is the proud home ground of Chapman's Peak Drive, one of the most scenically stunning passes in the world. Starting at Muizenberg and going around the Peninsula, you will come past Muizenberg, St James, Kalk Bay, Fish Hoek, Simon's Town, Cape Point, Scarborough, Kommetjie, Noordhoek, Chapman's Peak, Hout Bay, ending up in Cape Town. Towering 249 meters above the sea, making it one of the highest sea cliffs worldwide, Cape Point is situated at the southern tip of the Peninsula. It is here where the warm Agulhas current from the east coast and the cold Benguela current from the west coast meet each other, a sea area that is known for its devastating storms, hence the name "Cape of Storms". Often referred to as Cape Town's "Riviera", the Cape Town map shows you the Atlantic Seaboard region extending down from the & Waterfront just north of Table Mountain all along the west coast of the Peninsula, ending just short of Hout Bay. It includes some of the world's trendiest and most stunning beachfront locations, such as Llandudno, Green Point, Oudekraal, Sea Point, Bakoven, Fresnave, Camps Bay, Clifton and Bantry Bay, to name some of them. They compare with the best in the world. With the Twelve Apostles as backdrop and facing the Atlantic ocean they are all linked by one of the world's most beautiful scenic drives. The Southern Suburbs include Tokai, Woodstock, Constantia, Salt River, Bishopscourt, Observatory, Wynberg, Mowbray, Kenilworth, Rosebank, Claremont, Rondebosch and Newlands, extending outwards to the beautiful Kirstenbosch National Botanical Gardens and the grand manors of the very rich between the vineyards. The Southern Suburbs are primarily situated at the base of the Table Mountain National Park mountain range that runs like rocky backbone from Signal Hill and Table Mountain along the length of the Peninsula to Cape Point. It is also the area where the University of Cape Town can be found. The Helderberg region comprises Macassar and Lwandle, Gordon's Bay, Sir Lowry's Pass, Somerset West and Strand. With the Helderberg and Hottentots Holland mountain ranges sloping down into golf course estates and wine lands on the one side and a seaboard with stunning white beaches and warm waters on the other side, the Helderberg valley is visually one of the most spectacular regions in then Cape. The Cape Flats are large sandy plains situated between the Peninsula and the mainland. It is thought that the Flats were covered by the sea in prehistoric times and that the Peninsula was an island then. The region includes Athlone, Philippi, Crossroads, Nyanga, Grassy Park, Mitchell's Plain, Guguletho, Manenberg, Khayelitsha, Lansdowne and Langa. Most of the residents in this area are colourd and black people as a result of the Apartheid era when large numbers of the non-white population were forced to relocate here. Separated from the southern suburbs by the huge 250 hectares Century City commercial and residential development, the Northern Suburbs region comprises Bellville, Century City, Durbanville, Goodwood, Tyger Valley, Parow, West Beach, Welgemoed and Plattekloof. They differ from the Southern Suburbs in the sense that they are more middle class type of residential areas. Next to Century City, this suburban area also boasts Durbanville Wine Valley, a number of great wine routes and the Grand West Casino. The Blouberg coastline includes Bloubergstrand, Paarden Island, Melkbosstrand, Milnerton, Table View, Woodbridge Island, West Beach and Sunset Beach. Blouberg is most widely known for its 48 kilometers of bright sandy beaches and its magnificent panoramas of Table Mountain looking across Table Bay. Regarded as an area with one of the highest growth rates in the Western Cape, it lies en route from Cape Town to the West Coast.